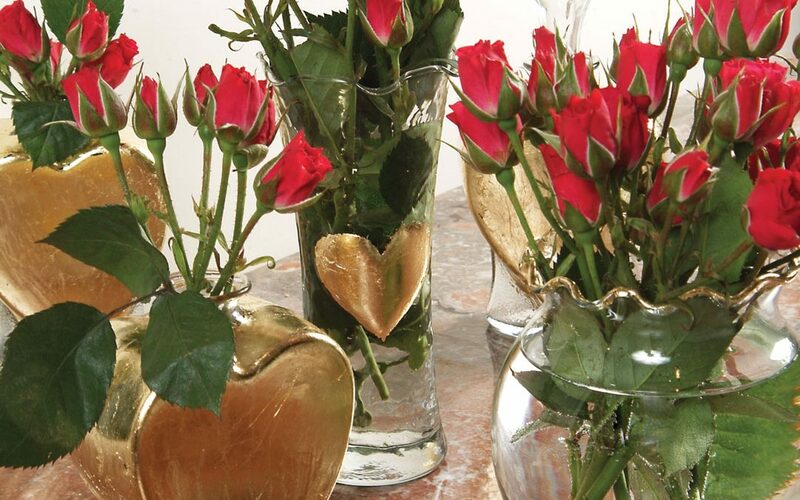 Create elegant valentine vases from ordinary clear glass containers of various shapes and sizes. With a paintbrush, paint a heart shape or a thin line on the top edge on a clear vase with adhesive sizing. Allow to dry for 1 hour. Carefully press gold-leaf sheet to area with adhesive with fingertips or a stencil brush. Remove excess gold leaf. Smooth lightly with stencil brush. When desired area is covered with gold leaf, paint a thin layer of sealer over gold leaf. Allow to dry for 1 hour. Fill elegant vases with valentine flowers, and give them to people you love or group together as a centerpiece for a special valentine dinner.